Maracas are Mexican musical instruments made by filling coconut shells or dried gourd shells with dried beans. 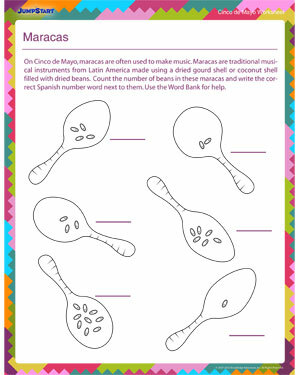 Look at the maracas in this Cinco de Mayo worksheet. Each one has a different number of beans inside it. Third graders must count the number of beans in each instrument and write the Spanish number word next to it. This free and printable worksheet is perfect for learning a few things about Mexican culture.